Every year as Rosh HaShana, The Jewish New Year, rolled in, my mom used to make this lamb biryani as a celebratory dish. The lamb was fork tender and still gorgeous pinkish inside, even after cooking for an hour and a half. Traditionally my mom adds potatoes into the dish, but I did not include them. The dish ages well over time, but potatoes are best when freshly cooked, not the next day or two. My mom also uses 4-5 chiles in this recipes but I toned it down. This particular version is super authentic even with the minor tweaks, directly from my mom's kitchen. Traditionally we cook the rice al dente by boiling it like pasta, draining, and then layering as you will see in the recipe. The entire layered biryani then is put on a low heat stove, with the lid on. The rice cooks further to perfection by the steam. In recent years my mom cooks the rice fully first as instructed in this recipe then layers it. That way you have the option to serve this dish deconstructed, each component on its own, if you wish. It is also a full proof method if you are a novice. You don't run into an issue of burning the bottom or risking the rice not being fully cooked. The flavors of every component come together in the Biryani in complete harmony with either method. I am very happy this Lamb Biryani was featured today, online, and this past Thursday, September 6, in print, in The Jewish Daily Forward's quarterly Food and Drink pull out section. You might remember I wrote about Indian Shakshuka among other articles, for the Jewish Forward's online food blog in the past, The Jew and the Carrot. Read the article with a bit of history of the dish and a full detailed recipe with fried cilantro, as a garnish, one of my mom's ingenious touches. I would like to take this opportunity to wish all of my family, friends and readers, Jewish or not, alike, Shana Tova Oo Metooka, שנה טובה ומתוקה A Good and a Sweet New Year. a Happy 5773 to you all! How lovely! Always amazed at the different versions of biryani from all over the world. The biryani I remember from childhood in Malaysia has a lot more tumeric in the rice, making it much yellower. But I think i will like your mum's version of full proof method against burning the rice at the bottom. Happy new year to you!! TY so much. easy peasy, just add 1/4-1/2 teaspoon turmeric to the rice. Woul dbe lovely yellow. I have a friend who was born and raised in Cochin, India. She makes Indian-Jewish fusion food that makes grown men cry and grown women swoon with delight! Photos of my own beagle Cujo sometimes appear in my blog posts (when he cooperates, anyway) ... I love the fact you do the same! Shanah Tovah! Hi Dena, What great description of your Cochini friend. Aww I will look for Cujo. Shana TOva to you and your family as well! A beautiful dish! So tasty. I love those wonderful flavors. You've done it again Shulie, my mouth is watering! Shana Tova! I wish I could share, Deb. :) Shana Tova my friend! I'd so love to dig into a big (vegetarian) bowl of this. How amazing this looks! Seriously, I need you to cook for me one day. Your food makes me drool. Hope you have a happy and healthy new year. I'm not particularly fond of lamb but this does look insanely delicious! Shana Tova, Shulie! I love biryani and like you do not add potatoes too mine .. carbs overkill! Biryani is simply a soul satisfying meal! Love it! This looks like an awesome biryani! biryani has to be one of my favorite dishes to cook and eat. Your photographs are outstanding! Thank you so much Asmita! Looks grand Shulie! We usually make chicken biryani, in fact I don't remember ever tasting lamb biryani. Its quite a rarity to see this type of meat hear around. I like the fact that your biryani is uncolored. I wouldn't mind some natural turmeric, but thats all. Cant stand when biryanis are green and red, looks artificial then. I would probably just go as far as adding turmeric to it but no further. So flavorful the combination as it is. In India they made it with mutton (as my mom refers to goat). We always made it with lamb or mutton. Rarely with chicken. Good point on availability. Makes me smile back! :) Thanks. Means so much! TY EA. No I haven't line is always around the corner. Also must admit I am not a cupcake aficionado, but I love the art of the frosting. I hope your hubs snags few for your daughter espc. since she watches the show. :) I know kids absolutely love them. I love biryani with any thing (veggie, shrimp, chicken or lamb) but my most favourite one would be with lamb. 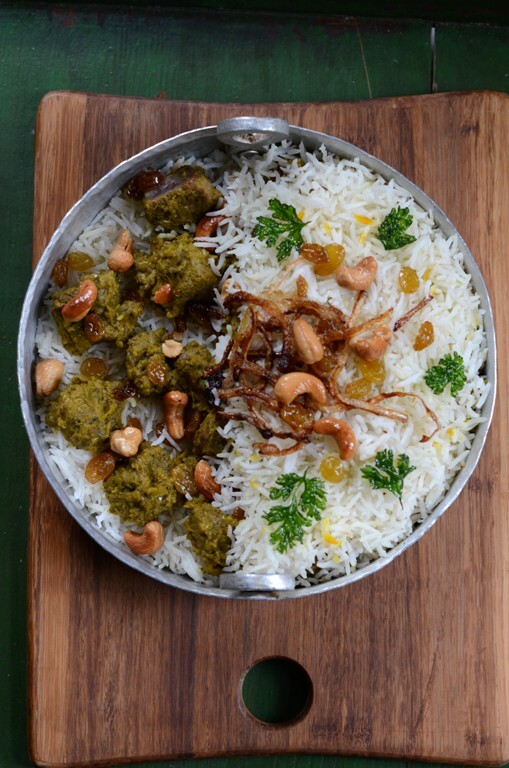 Infact my next post is my motherinlaw's chettinad lamb biryani. The recipe is little different from yours and I am loving those pretty pictures. I am sure everyone would have loved it so much and if you managed to save some, try tasting it the next day. It's much more tasty the following day. TY Vijitha. Looking forward to your biryani post and absolutely next day or two are the absolute best! :) In fact I don't believe I had it the day of for some reason. May the new-year brings you everything you'd like, happiness and health. SO beautiful, Shulie...and I'm certain it tastes just as marvelous as it looks. Wishing you a sweet New Year! Happy New year Shulie :) I love biryani .. it's comforting and taste even better the next day! Happy New Year! What a beautiful recipe to celebrate. Each picture was stunning, and I loved reading about what makes this biryani so special. Thank you for sharing! Thank you Monet as sweet as usual. Shana Tova. This is a beautiful recipe filled with warmth for the New Year. I don't make lamb and I think, I should change this. 'warmth' well put Chaya. We don't make it often. Usually for special occasions! :) You absolutely should! Excellent recipe. Simple and delicious recipes. Living in Europe has made me realize and discover all of the customs of different Jewish cultures that i never knew existed. I love dipping into other cuisines for holiday meals; And as I told you on twitter, I have been wanting to make a Biryani for years. Your lamb biryani looks amazingly good. I love eclectic holiday tables & thx Jamie, you should it is absolutely divine, a special treat!